Bangalore is a modern and highly urbanized city. As the technological hub of the country, it is the most important and often visited city in the state of Karnataka, South India. It is known both for its modern high-rise buildings and colonial and historical structures such as palaces, forts and temples. Natural resources such as waterfalls, hills and caves, as well as this lake, are also top tourism draws. The city is also a haven for shopaholics, and foreign tourists will be delightfully surprised to discover how shopping is done in Ulsoor Lake. Here’s how you do it. Rent a boat and enjoy boating in the lake as you would in any other lakes. Then, if you are really into shopping, stop at the many tiny islands and do some shopping. You will find a variety of interesting souvenir items that are truly worth taking home. Boating and shopping in Ulsoor Lake is quite an experience, and it is nice taking home a memento to prove that you’ve done it while in India. Boating, shopping and sightseeing are clearly the top attractions and to-do in the lake. But what really draws the crowd from all over the country is the Ganesh Festival that takes place on the birthday of Ganesha in either August or September, according to the Lunar calendar. This is one of the most highly anticipated festivals in India since Lord Ganesh is the Supreme Lord, the Brahman himself. This Hindu deity is the source of all bliss and the giver of virtues and successes in life. He is the energy of Lord Shiva. One of the highlights of the festival is the making and worshipping of clay figures of the deity that could last from two to ten days. The town of Ulsoor in the eastern parts of Bangalore used to be an important town with a growing economy. Kempe Gowda II, son of Kempe Gowda, the founder of Bangalore, built Ulsoor Lake as testament to the growing importance of the region. Legends have it that Kempe Gowda II spoke with God Somesvara in his dream and was instructed to unearth a hidden treasure. He apparently found the treasure and on the spot he built the Somesvara pagoda in Ulsoor, and eventually built the lake on the forest area where he slept and had the dream. The pagoda still stands today. Today, only faint reminders of the glorious bygone-years may be seen in Ulsoor town. 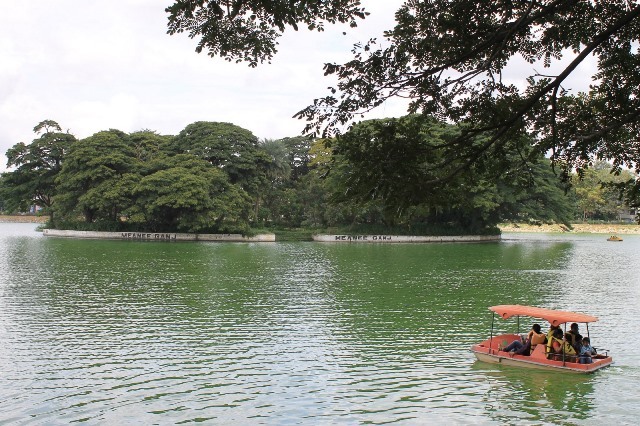 Still considered as Karnataka’s “City Market”, Ulsoor’s only real attraction is the magnificent lake. Tourists are advised not to swim in Ulsoor Lake since the weeds and lotus could be dangerous when swimming. There is a nearby swimming pool complex if one wishes to beat the South Asian heat. Also nearby is a huge Sikh shrine, a temple and Kensington Park.